The Katahdin Woods & Waters Scenic Byway is where you can relive the experiences of the hearty souls who ventured into the great north woods. Travel the headwaters of the Penobscot River, where ancient trails and portages were used by the Wabanaki (collectively the people of the Penobscot, Passamaquoddy, Micmac, Maliseet and Abenaki tribes), followed by early explorers, trappers, lumbermen, and modern day recreationists. View or climb Katahdin (Ktaadn), home to the Indian Spirit, Pamola, the Storm God and Protector of Ktaadn. Described as having the body of a man with the head of a moose and the wings and talons of an eagle, Pamola was feared by native people and made exploration of Ktaadn taboo. Follow in the footsteps of artists, such as, Frederic Church, Marsden Hartley, Winslow Homer, Carl Sprinchorn, and Jake Day, who were seduced by the beauty and grandeur of the region. Ash Hill provides an outstanding 360° view of Katahdin, the mountains surrounding Baxter State Park, and long views toward the Allagash and Aroostook County. Travelers will find many stopping places filled with historic and cultural information, such as the Patten Lumberman’s Museum or the Boom House on Ambajejus Lake, listed on the National Register of Historic Places. Canoe the remote East Branch of the Penobscot River with its seven waterfalls or whitewater raft the West Branch Penobscot – considered the best whitewater in Maine. Take a picnic lunch and enjoy the ride especially during the fall foliage. Stay into the evening to view stars in one of the darkest sky locations in North America. In winter, a portion of the Byway becomes a major snowmobile trail to explore a magical winter wonderland. The Katahdin Woods & Waters Scenic Byway is a must see for a great, nature-based experience. The Byway is 89 miles long and extends from the Baxter State Park boundary near Togue Pond over Baxter Park and Millinocket Lake Road to Millinocket where it joins Route 11 to East Millinocket and Medway. The route turns northerly in Medway on Route 11 to Stacyville and Sherman, then north to Patten, home of the Lumbermen’s Museum. From Patten the route follows Route 159 through Mount Chase and the Village of Shin Pond to the northern boundary of Baxter State Park at Matagamon. The Katahdin Woods & Waters Scenic Byway can be accessed from I-95 at Exit 244 in Medway and Exit 264 in Sherman. 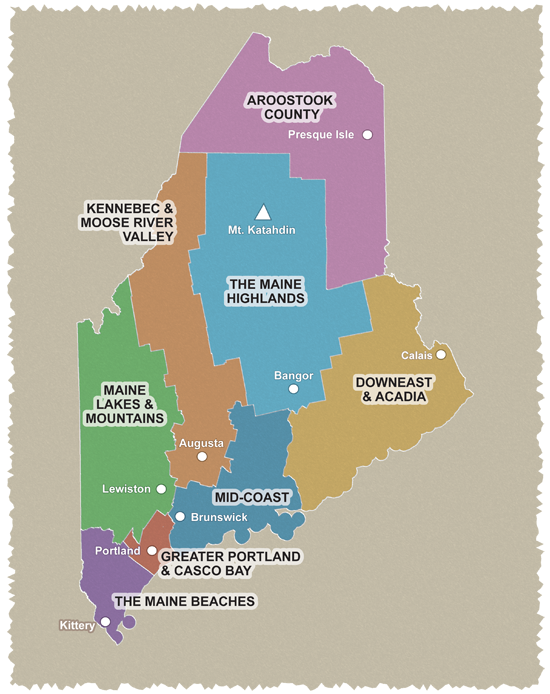 The Byway offers miles of travel parallel to the East Branch Penobscot River, with side trips along the West Branch, as well as breathtaking views of Katahdin and the Appalachian chain. The journey provides a mix of pastoral farms, meadows, recreational trails, and working forests filled with wildlife and significant natural areas.